The Age of Discovery returns! The danger posed by J’Ula underscores that we have more to learn about this period in our history, and you’re about to encounter it firsthand. Secrets buried and mysteries left unsolved have the potential to send aftershocks rippling through the quadrant. One of the first is the Discovery: Operations Pack. The Operations Pack contains assets that will ensure you’re more than a match for the troubles ahead, whether by cutting-edge tech or elite personnel… or a very grumpy tardigrade. All of these ships will also have fleet versions available. And that’s not all. This pack contains the Walker-class Prototype Light Exploration Cruiser, and an all-new costume for it exclusive to this bundle! More details on these exciting new starships will appear in an upcoming blog, so stay tuned! 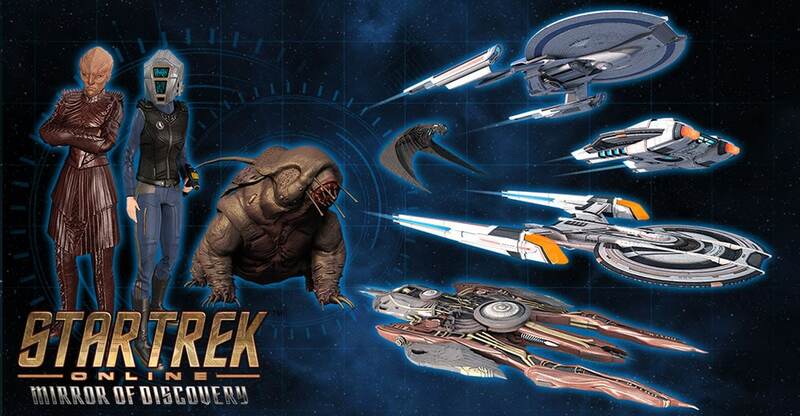 In addition to the ships above, we’ll be including a new Very Rare Science/Miracle Worker Bridge Officer with unique costume pieces to keep them running, a Combat Tardigrade to guard them, new titles for Federation and Klingon officers to use, XP Boosts, Master Keys, and High End Upgrade Kits. The Tardigrade is a heavy melee threat, capable of absorbing incoming fire and responding with its devastating bulk. It occasionally scatters nearby enemies while pinning the target of its ire. The Starfleet Bridge Officer is cybernetically enhanced, coming with a tactical helmet costume and the Target Designator trait. The Designator paints a target among ground enemies, significantly improving damage against that target for several moments before it automatically reapplies. The Klingon Bridge Officer comes with T’Kuvma’s outfit and the For the Empire trait. When the Captain is grievously wounded, this trait causes the officer to charge the enemy who dealt the blow, taunting them into a duel for a period of time. The Discovery: Operations Pack will be available very soon for 12,000 Zen. However, for a limited time after launch, the bundle will be available for 30% off! That's a discounted price of 8400 Zen! The individual items from the bundle will also be on sale in the C-store. The pack is a trove of treasure that will ensure you are as ready as you can be to confront the mysteries of the past.